It is one month since I launched Reinventing Parking and now seems like a good moment to take stock of how the blog is going. If you are new here, scroll to the bottom of this post to explore some of the popular posts so far. Otherwise, read on. This blog has a purpose which is not just about getting a large audience (so you won't find funny 'parking fail' videos here ... or not very often anyway). But of course I am pleased that the audience is growing steadily with over 200 subscribers so far. Nevertheless, it is time to ASK YOU what you want from this blog. Is the blog relevant to your location? I can't write about every specific place every week but I hope most readers will find something of interest even in items from other continents. Am I correct? How could I make it more relevant to you? What are the burning parking issues where you are? What parking policy questions are you most curious about? Have I tackled them yet? Please suggest topics for me to cover (or to find a guest blogger to cover). Tell me who you are via comment or email. Am I reaching urban planners or transport planners in government, municipalities or in private practice? Are most of you researchers or students? Are Reinventing Parking readers in non-profits or community organisations? 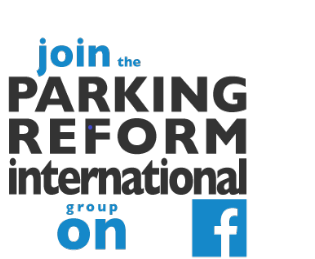 Are you in the for-profit parking industries? Are you activists? Thanks to everyone who has already sent me tip-offs for events, publications, new studies and news items to cover. Please keep them coming. Thanks to everyone who has commented. But there aren't very many of you yet! Tell me what I am doing right and what I am doing wrong by commenting on this post or emailing me (see the link at the top-right on the home page). Please share the word about Reinventing Parking! If you enjoy Reinventing Parking or find it useful, please stop to think of two or three people you know who might also benefit from it. Send them a message to tell them! By the way, if your contacts are in China, the site may be blocked to them. But you can invite them to subscribe by email with this link: http://feedburner.google.com/fb/a/mailverify?uri=ReinventingParking. Do you have a blog or website on a related topic (eg urban planning, architecture, urbanism, urban transport, sustainable cities, public transport, etc)? Please link to me! I will try to reciprocate (if your site meets my guidelines) and link to at least your parking-related posts or sections. Many thanks to the bloggers who have already linked here. Thanks especially to those who have written warm recommendations. Examples include: Human Transit, Market Urbanism, PCI Parking blog, Streetsblog Network, PT's parking blog and others. I tweet on urban transport issues, with a strong emphasis on parking. So follow me on twitter and retweet me when I hit the spot for you. Footway parking was a popular post. This example is in Manila.